Are you planning to move your vehicle abroad? Whether it is personal vehicles or larger commercials vehicles, Pelichet ships thousands of vehicles each year in international, ro-ro or container transport. Whatever your destination, Pelichet has the solution to ship your vehicle. 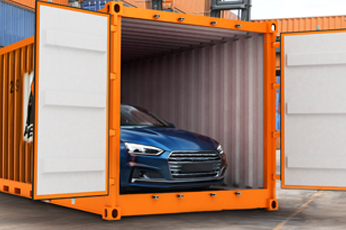 From your home, your vehicle is loaded into a custom container. Be sure to follow our recommendations below. Pelichet handles all the paperwork. After clearance, Pelichet delivers your vehicle directly to your new home. 8 tips to get your vehicle ready for its move. Keep the minimum of fuel into the tank (less than ¼) for safety reasons. The battery of your vehicle must be completely charged, in order to stay charged for the duration of the trip. To avoid battery consumption, disable your vehicle alarm system. To avoid a mechanical issue on arrival, have your vehicle checked out beforehand. Check the engine coolant and antifreeze if the climate in the country of destination is very different from the country of origin. Wash your car a few days before the shipping. It will make r the inspection, during pre-delivery and receipt steps, easier. Take all objects and documents out of the vehicle before the transfer. Always keep a spare set of keys to your vehicle with you.